When I was pregnant, I swear I went through at least a box of freezer waffles a week. Especially in the first trimester, there were a few foods I craved all the time: bagels with inches of cream cheese, frozen waffles with lots of butter and Indian food. Gah, can you imagine being sweet Vander in my belly!? Having to deal with a constant influx of loaded breakfast foods and spicy curry? Poor thing. I vividly remember standing in the kitchen those first few weeks, hurriedly eating a bagel while I was waiting for my frozen waffles to be done toasting. Whenever I see a bag of bagels, I am instantly transported to that time. St. Louis friends, you will know I’m pregnant again when there is a shortage of whole-wheat frozen waffles at Trader Joe’s. Ironically, I was never a breakfast fan. Even now, I still prefer my dinner leftovers than traditional breakfast foods. I think that’s why I fell so hard for the concept of avocado toast; it feels like lunch but has become a perfectly acceptable breakfast option. It’s probably why my breakfast today consisted of a bowl of leftover red lentil soup and a few cuties. However, that all goes out the window when it comes to our weekend fare. Suddenly, I’m back to craving those waffles again. With a cup of my cashew chai latte, of course. BL started this obsession a few months ago when he begged for homemade waffles one weekend and ever since, we’ve been hooked. Especially after a good family walk/jog around the neighborhood, it’s fun coming back to the house to snuggle in for a lazy morning with waffles. The good news? You don’t have to wait for Saturday to make these! Whip up a batch this weekend and then freeze the rest for whole-grain breakfasts (or dinners!) throughout the week. Forget frozen waffles and make your own. To turn these into freezer waffles, allow waffles to cool to room temperature and then place in a ziploc bag, separating the layers of waffles with parchment paper or foil. Label the bag, then freeze for up to 2-3 months. 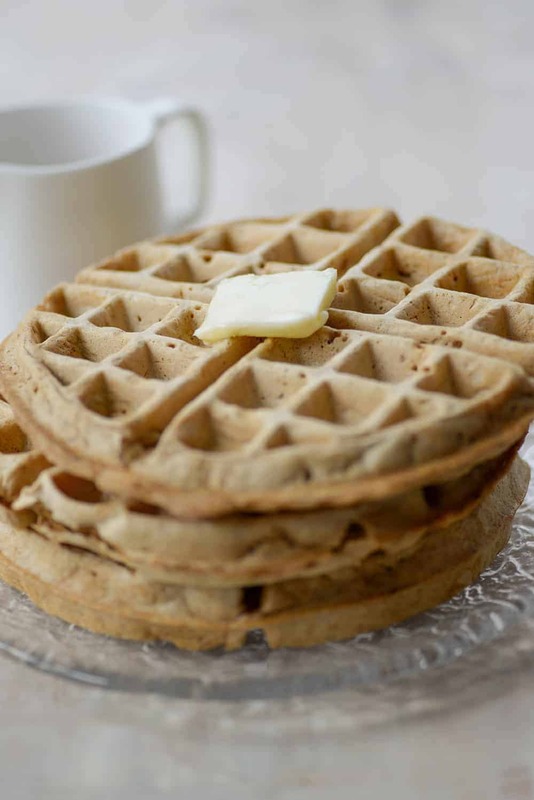 To reheat, remove waffles from the freezer and place directly in the toaster or toaster oven. 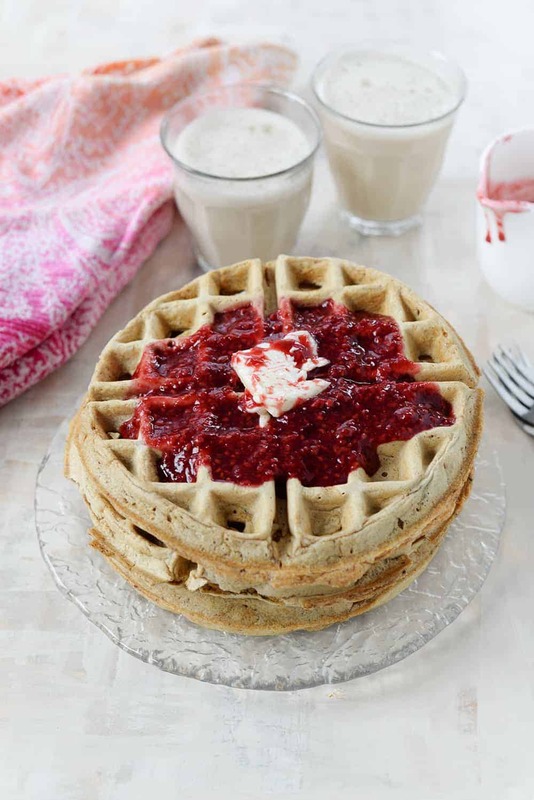 How to make whole wheat freezer waffles! 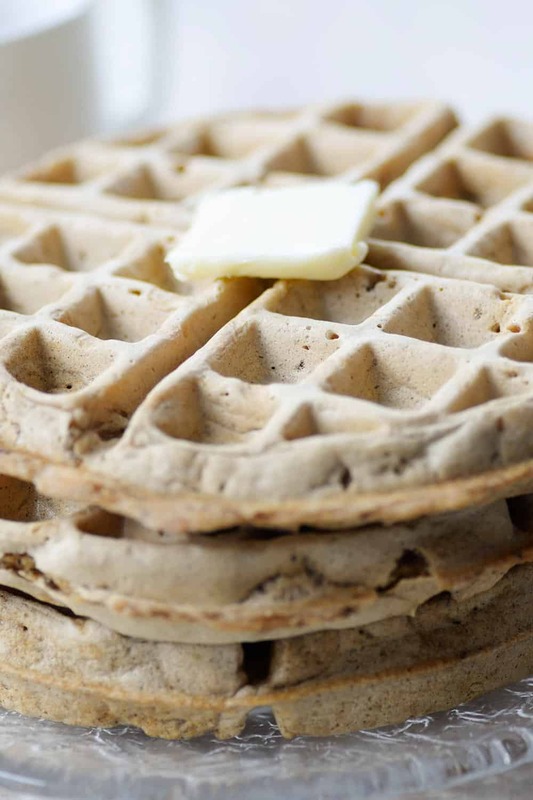 If you like whole wheat waffles, then you’ll want to DIY your own. Perfect for busy mornings! Preheat a waffle iron. In a large mixing bowl, combine the flour, baking powder, baking soda, salt and cinnamon. In a medium mixing bowl, whisk together the eggs, milk, butter, vanilla and brown sugar. 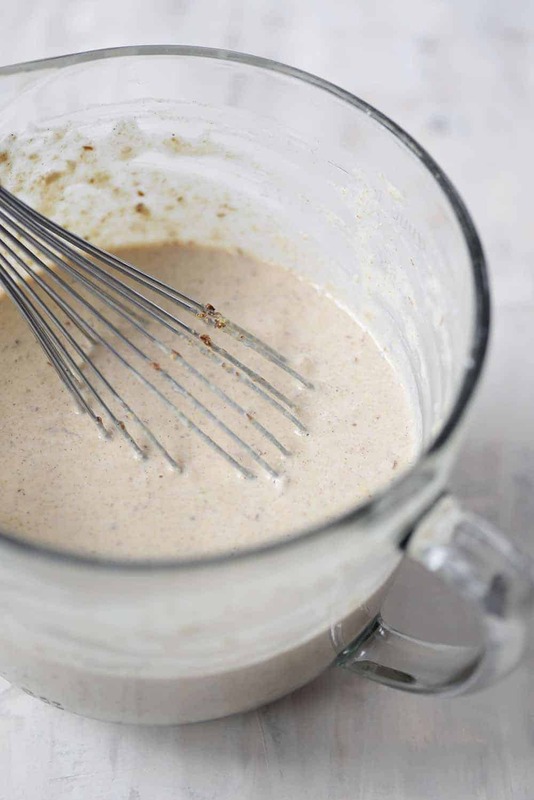 Pour wet ingredients into the dry ingredients and stir until just combined;the batter will be slightly lumpy. Cook waffles following the waffle iron manufacterer’s instructions. Serve warm or freeze for later. These look so good! 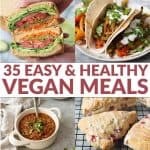 Will it be okay to use flaxseed egg and soy milk for this recipe? Thanks! Hi Megan, possibly! I haven’t tried that, but it may work. Since there is already flax meal in these, I would try using a flax egg and not adding the additional flax meal. I haven’t tried that, but it’s what I would try first. Or, you could substitute in an egg replacer. Bob’s Red Mill just came out with a great one that I like. Thank you. I may try these because my husband loves waffles! I will look out for Bob’s Red Mill egg replacer. Thanks! I hear you! Freezer waffles are a life saver during the first trimester lol! Thank you so much for the review and sharing your love for convenient, wholesome breakfast options with your readers! These are fantastic! 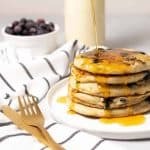 I switched out my son’s eggos for these, and they are so much more flavorful, and still just as easy to make in the toaster. I used almond milk instead of regular milk with no issues.